Nano Biomedicine, 7(2), 72-80 (2015). 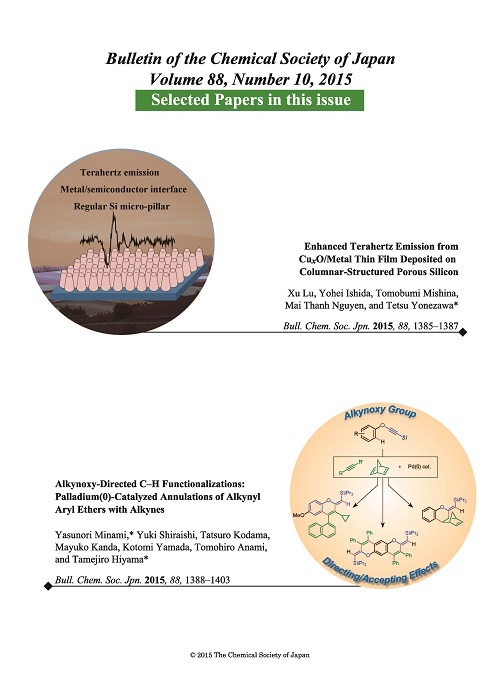 Bulletin of the Chemical Society of Japan, 89(3), 346-353 (2016). Abstract: Ability of surface assisted laser desorption/ionization mass spectroscopy (SALDI-MS) of low-molecular-weight compounds using six types of commercially available TiO2nanoparticles was examined. In all cases, TiO2 nanoparticles gave strong Na+ adduct sample ion peaks. Some chemicals, which rarely show proton adduct sample ion peaks by MALDI-MS, such as aspirin and barbital, could be easily detected by using TiO2 NPs. The key factors determining the SALDI ability of TiO2 NPs are their purity, ratio of rutile, and particle size. Abstract: A de novo synthesis of gold-nanoparticle-embedded, nitrogendoped nanoporous carbon nanoparticles (Au@NC) was investigated in this work. Chloroauroic acid was encapsulated inside zeolitic imidazolate framework-8 (ZIF-8) nanoparticles during the synthesis and later reduced into gold nanoparticles. The as-synthesized gold-nanoparticle-embedded ZIF-8 (Au@ZIF-8) was then carbonized into Au@NC to enhance the stability of the nanoporous support. The results show that Au@NC exhibits a porous structure containing 3 wt% of gold. 2-Methylimidazole provided an abundant amount of nitrogen (19 wt%) on the carbon matrix, which resulted in a hydrophilic and positively charged surface that is useful for the reduction of 4-nitrophenol. The results of the catalytic reaction indicate that synthesized Au@NC could act as an effective catalyst with a turnover frequency (TOF) of 1185 g-1 s-1 , which is higher than that of conventional naked Au nanoparticles (TOF: 339 g-1 s-1 ) and that of Au nanoparticles on activated carbon (TOF: 89 g-1 s-1 ). We propose that the enhanced performance of Au@NC resulted from homogeneous distribution of Au nanoparticles along with the hydrophilic and positively charged nitrogen-doped carbon surface. RSC Advances, 5(124), 102904-102910 (2015). DOI: 10.1039/C5RA21402E (Published (web) 25 November 2015). Abstract: Metallic copper fine particles were prepared by chemical reduction of CuO in the presence of thermally degradable poly-1,4-butanediol-divinylether (BDVE). Because a BDVE thin layer formed on the particle surfaces, the obtained copper particles were stable and did not undergo obvious oxidation under ambient conditions. The ether groups of BDVE were hydrolyzed with protons, and this generated small fragment molecules. The BDVE-stabilized copper fine particles and their pastes can be therefore sintered at 150 °C in the presence of protons. Electro-conductive films with a relatively low resistivity of 8.5 × 10-5 Ω cm were obtained on a glass substrate in the presence of formic acid, and hot pressed conductive pellets with a resistivity of 2.9 × 10-5 Ω cm were also obtained without any pre-oxidative annealing in the presence of proton generator molecules at very low temperatures. The hot pressed pellets show a high anti-oxidative ability and their corrosion tests reveaed their good anti-corrosion property. Physical Chemistry Chemical Physics, 17(48), 32511-32516 (2015). DOI: 10.1039/C5CP06107E (Published (web) 11 November 2015). Abstract: Metallic copper fine particles used for electro conductive pastes were prepared by the chemical reduction of cupric oxide microparticles in the presence of gelatin. After the reduction, the fine particles were collected by decantation with pH control and washing, followed by drying at a moderate temperature. The surface oxidation state of the obtained copper fine particles could be considerably varied by altering the pH of the particle dispersion, as shown by X-ray diffraction and high-resolution transmission electron microscopy. Our results strongly indicate that decantation under a nitrogen atmosphere can prevent the oxidation of copper fine particles but a slight oxidation was found. Abstract: Platinum (Pt) is widely applied for electrochemical catalysts, thus creating porosity in Pt-based materials would enhance their catalytic efficacy. This study demonstrates a new route to synthesize a Pt material with macropores and spherical morphology by the combination of evaporation induced self-assembly of a hard template (i.e., silica nanoparticles) and infiltration/reduction of Pt series in micro-emulsion systems. The synthesized macroporous Pt microballs (denoted as MPtM) are characterized with scanning electron microscopy (SEM), transmission electron microscopy (TEM), and it is found that MPtM exhibits uniform macropores (diameter of 300 nm) and Pt crystalline framework, which would be potential for enhanced catalytic reactions. Scientific Reports, 5, 15372 (2015). Abstract: Knowledge on the synthesis of cationically charged fluorescent gold nanoparticles (Au NPs) is limited because the electrostatic repulsion between cationic ligands on the surface of NP hinders the formation of small Au NPs (usually less than ca. 2 nm) during nucleation in solvents. We herein propose a novel methodology for a synthesis of water-dispersible, cationic–thiolate protected fluorescent Au NPs by the sputtering of Au into liquid matrix containing thiolate ligands. By controlling mercaptan concentration the size and photophysical characteristics of Au NPs were directly controlled, resulting in near IR fluorescence with a 0.9% of absolute quantum yield. Cationically charged fluorescent metal NPs are promising, especially in biological fields, and this work provides a novel methodology towards the synthesis of a new series of functional metal NPs. Physical Chemistry Chemical Physics, 17(41), 27653-27657 (2015). Abstract: This paper illustrates the directed self-assembly of mesoporous TiO2 with magnetic properties due to its colloidal crystal structure with Fe3O4. The Fe3O4 nanoparticles were synthesized using co-precipitation techniques to a size of 28.2 nm and a magnetic saturation of 66.9 emu/g. Meanwhile, mesoporous titania nanoparticles (MTN) with a particle diameter of 373 nm, specific surface area of 236.3 m2/g, and pore size of 2.8 nm were prepared by controlling the rate of hydrolysis. The magnetic colloidal crystal (diameter of 10.2 μm) was formed by the aggregation of Fe3O4 and MTN caused by the interface phenomena during solvent evaporation in emulsion. Even the anatase octahedrite produced from the colloidal crystal after hydrothermal reaction maintained a magnetic saturation of 2.8 emu/g. This paper also investigates the activity of our syntheiszed material as a photocatalyst by testing its organic photo-degradation, while utilizing its magnetic property for laboratory reuse. Journal of Nanoscience and Nanotechnology, 15(11), 9272-9274 (2015). Bulletin of Chemical Society of Japan, 88(12), 1755-1759 (2015). Abstract: It has been found in this study that the glass transition temperatures can be considered as the lowest temperature for sintering metal fine particles to obtain electro-conductive metallic layers from the differential scanning calorimetry measurement of the fine particles. Gelatin-stabilized copper fine particles could be sintered to form an electrically conductive copper layer with a resistivity of 1.9 × 10-5 Ω cm at as low as 150 °C using oxidation-reduction two step sintering. Journal of Biomedical Nanotechnology, 12(3), 472-480 (2016). Abstract: We assessed the biocompatibility of nano-sized ceramic particles with several cells types. Though these particles have less than 100 nm in diameter, they act as submicron-sized particles in saline by aggregation that was estimated using laser diffraction particle size analysis (LDS). they act as submicro-sized particles in saline by aggregation based on laser diffraction particle size analysis (LDS). Several types of cells (osteoblasts, osteosarcoma and hepatocyte cells) were exposed to these particles and their cytocompatibility was estimated. Not only the cytotoxic assay but also their static and dynamic morphology under nanoparticles exposure were investigated. The intercellular uptake of particles was determined using a confocal fluorescence microscope. The particles used in this study did not inhibit cellular activity or growth even when their concentrations were high. Only copper oxide particles caused acute cytotoxicity depending on the particle size. The cytotoxicity assay, dynamic behavior of the nanoparticle-exposed cells and their examination under a confocal fluorescence microscope suggests that the irritative reaction was induced by contact between the cells and particles, whereas eluted copper ions are not dominant factor. These results indicate that nano-sized particles used in this study have excellent biocompatibility except copper oxide ones. Physical Chemistry Chemical Physics, 17(38), 24556-24559 (2015). Abstract: A novel microwave-induced plasma technique to modify commercially available TiO2 nanoparticles is reported here. Following plasma treatment, TiO2 nanoparticles displayed enhanced visible absorption due to the doping of W atoms. The photocatalytic degradation of methylene blue at 440 nm was successfully improved using of these modified nanoparticles. Journal of Nanoscience and Nanotechnology, 15(12), 9802-9806 (2015). Abstract: Monodisperse and mesoporous europium (Eu)-doped titania nanoparticles (denoted as Eu-MTNs) were prepared by a co-synthesis method with the presence of a cationic surfactant (i.e., CTAB).A maximum loading amount of 8 mol% of Eu could be successfully incorporated into the framework of MTNs. The synthesized Eu-MTNs samples were characterized with X-ray diffraction (XRD) and scanning electron microscopy (SEM), with their luminescent property examined by photoluminescence(PL). Under ultraviolet irradiation, the Eu-MTNs samples exhibit several characteristic luminescence corresponding to 5D0–7Fj for Eu3+ ions, which can be attributed to the energy transfer from titania nanocrystallite to Eu3+ ions dispersed in amorphous mesoporous titania region. The potential intracellular bio-imaging application of the synthesized Eu-MTN nanoparticles was demonstrated with a breast cancer cell line (i.e., BT-20). High biocompatibility and strong luminescence of the Eu-MTNs show great potential in biomedical applications. RSC Advances, 5(75), 61290-61297 (2015). Abstract: A conductive paste was prepared with submicrometer-sized copper fine particles that were coated by a gelatin nanoskin. The average particle size was ca. 130 nm. After drying, an oxidation-reduction two-step sintering process was proposed for these submicrometer-sized copper fine particles to obtain low-resistivity layers at a very low temperature. The optimized conditions gave a low resistivity of 8.2 × 10-6 Ω cm, even when the particles were covered by a common polymer. Our results suggest that the formation of the small copper oxide prominences on the surface of the copper fine particles could be reduced at low temperatures, forming connected submicrometer-sized metallic copper particles. Bulletin of Chemical Society of Japan, 88(10), 1385-1387 (2015). Download PDF file from HERE. Abstract: We propose a novel method to enhance the THz emission from CuxO/metal nano thin film by using columnar-structured micro-sized porous silicon (MS-PSi) as the substrate. THz emission was improved several times higher than that from the planar substrate due to the decreased optical reflectance and enlarged surface area. Journal of Materials Chemistry C, 3(32), 8358-8363 (2015). Abstract: A nano-island structured SiOx (x ≤ 2)/CuxO (x ≤ 2) composite was prepared from a Cu deposited Si wafer by electrochemical anodization in a hydrofluoric acid (HF) and ferric nitrate (Fe(NO3)3) electrolyte. The surface composition of the nano-island consisted of Cu, Cu oxides, Si nanoparticles and Si oxides. The distribution of Cu element on the surface was uniform. Cracks and native Cu oxides in the deposited Cu layer are two main factors for the formation of the nano-island structured surface. Different from a single red photoluminescence (PL) band emitted from the electrochemical anodized bare Si wafer, an uncommon dual-visible-band PL at red and blue ranges respectively with comparable intensity was observed. The red PL quenching in Cu ions doped nanostructured Si did not happen due to the different distribution areas of Cu+ and red PL centre.The origin of the red PL was due to oxygen defects in the band gap of Si nanoparticles/Si oxides; the blue PL was the consequence of the transitions between 3d10 ↔ 3d94s1 of Cu+ ions and the intra d → d band transition of Cu2+ ions in the interstitial vacancies of Si oxides. Compared to the electrochemical anodized bare Si sample with a single PL band, the nano-island structured SiOx/CuxO composite emitting a dual-PL-band is more promissing for making white light emitter. 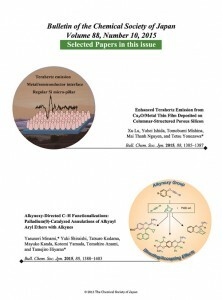 Chemistry Letters, 44(10), 1327-1329 (2015). PDF files can be downloaded from HERE. Abstract: We herein report a novel synthesis of black TiO2nanoparticles by using a microwave-induced plasma over Ti complex aqueous solution. The resultant TiO2 nanoparticles showed very strong reflectance over the whole visible light region. Detailed HAADF-STEM analysis of the obtained particles revealed that this plasma method enables to dope W ions inside the TiO2 crystal structure. New Journal of Chemistry, 39(8), 6267-6273 (2015). Abstract: A column-shaped porous silicon (PSi) sample was successfully prepared by electrochemical anodization in a hydrofluoric acid (HF) containing electrolyte. PSi exhibited an unstable red photoluminescence (PL). The PL arose from the surface oxygen defects under quantum confinement effect and degraded as the exposure time in air increased. After hydrofluoric acid treatment and 2-min Cu sputtering coating, the PL-degraded aged column-shaped PSi showed a dual PL bands at blue and yellow range. Cu-coated fresh PSi without aging and Cu-coated aged PSi without HF treatment did not show that result. The PL intensity of these two bands was improved compared to that of the fresh column-shaped PSi. These two emissions also showed a relatively good stability as determined from the same intensity after air treatment for three months. The improvement of PL can be attributed to the surface unstable SiO that combines with the sputtered Cu, forming new Cu related defect sites and surface nanostructures. The method in this study does not require any heating treatment, because SiO is very unstable, particularly in a high-moisture environment. New Journal of Chemistry, 39(8), 5895-5897 (2015). Abstract: Here we report for the first time the synthesis of octadecanethiol–capped gold nanoparticles (Au NPs) by sputtering of Au over a liquid matrix (silicone–oil). Au NPs prepared in silicon–oil showed plasmon absorption; however, those prepared in the presence of 1–octadecanethiol did not show plasmon absorption but fluoresced in the near IR region. 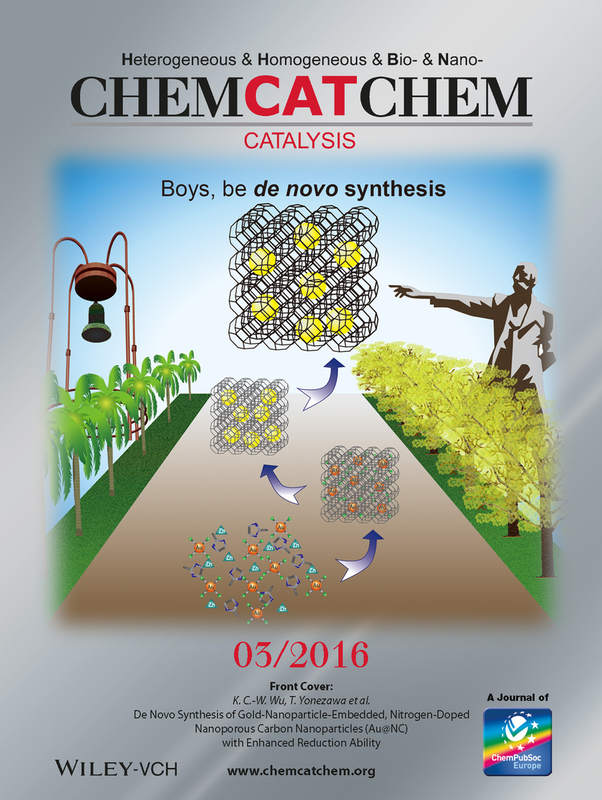 New Journal of Chemistry, 39(6), 4227-4230 (2015). Abstract: We herein propose a novel methodology to synthesize silver nanoparticles with precisely controlled diameters in single nano-meter orders by sputtering into a liquid matrix (polyethylene glycol) containing mercaptans (11-mercaptoundecanoic acid) as an environmental friendly preparation without reductants. Journal of Materials Chemistry C, 3(23), 5890-5895 (2015). Abstract: To facilitate sintering of copper particles at low temperatures and achieve excellent electrical conductivity of copper films, reducing particle size is a common method. However, strong reducing agents which are usually used for reducing the size of particles limit their application. Here we report a novel approach to obtain highly conductive copper films. Firstly, copper fine particles were prepared by a one-pot reduction reaction utilizing D-isoascorbic acid as a mild reductant. Secondly, tight connection facilitating the sintering of particles was formed by generating convex surfaces, nanorods or nanoparticles during the oxidation procedure. The mechanism of the oxidative preheating process and its effects on the conductivity were clarified. High conductivity of copper films at low temperatures can be achieved due to the critical role of the oxidative preheating process. New Journal of Chemistry, 39(6), 4214-4217 (2015). Abstract: We propose a novel synthetic approach for cationic charged platinum nanoparticles via the autocatalytic hydrolysis of acetylthiocholine. This method can be extended to the platinum group of metals. Abstract: This paper proposes a novel methodology to synthesize highly fluorescent gold nanoparticles (NPs) with a maximum quantum yield of 16%, in the near-infrared (IR) region. This work discusses the results of using our (previously developed) matrix sputtering method to introduce mercaptan molecules, α-thioglycerol, inside the vacuum sputtering chamber, during the synthesis of metal NPs. The evaporation of α-thioglycerol inside the chamber enables to coordinate to the “nucleation stage” very small gold nanoclusters in the gas phase, thus retaining their photophysical characteristics. As observed through transmission electron microscopy, the size of the Au NPs obtained with the addition of α-thioglycerol varied from approximately 2–3 nm to approximately 5 nm. Plasmon absorption varied with the size of the resultant nanoparticles. Thus, plasmon absorption was observed at 2.4 eV in the larger NPs. However, it was not observed, and instead a new peak was found at approximately 3.4 eV, in the smaller NPs that resulted from the introduction of α-thioglycerol. The Au NPs stabilized by the α-thioglycerol fluoresced at approximately 1.8 eV, and the maximum wavelength shifted toward the red, in accordance with the size of the NPs. A maximum fluorescent quantum yield of 16% was realized under the optimum conditions, and this value is extremely high compared to values previously reported on gold NPs and clusters (generally ∼1%). To our knowledge, however, Au NPs of size >2 nm usually do not show strong fluorescence. By comparison with results reported in previous literature, it was concluded that these highly fluorescent Au NPs consist of gold–mercaptan complexes. The novel method presented in this paper therefore opens a new door for the effective control of size, photophysical characteristics, and structure of metal NPs. It is hoped that this research contributes significantly to the science in this field. Abstract: Highly ordered double-wall TiO2 nanotube arrays were obtained by a two-step anodization method in a fluoride-containing glycerol based electrolyte. The low water and fluoride content and high viscosity of the electrolyte support a partly undissolved fluoride-rich layer, and its hydrolyzed products remain on the tube walls. The double-wall structure and a cladding layer originating from the fluoride-rich layer were clearly observed after annealing. The morphology and crystal structure of the cladding layer were investigated. The study of the cladding layer gives a fundamental insight into the wall structure design of the anodic TiO2 nanotubes in the glycerol-based electrolyte.